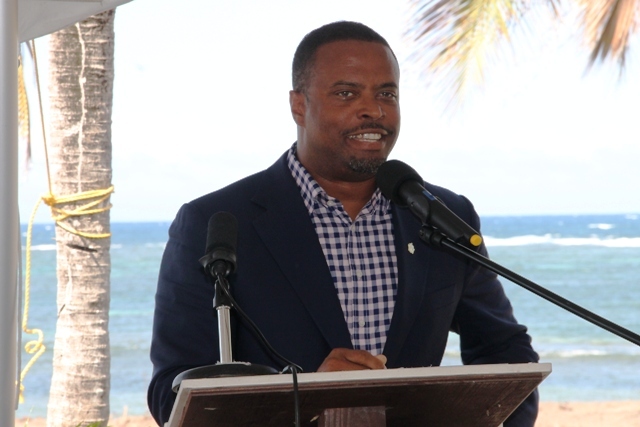 NIA CHARLESTOWN NEVIS (APRIL 22, 2015) — Deputy Premier and Minister of Tourism on Nevis Hon. Mark Brantley said ground-breaking for the US$20 million HTRIP Candy Resort Villa Development at Liburd Hill, marked the delivery of another project that would enhance the island’s economic activity. Mr. Brantley’s comment came when he delivered remarks at the ground breaking ceremony on April 17, 2015. He said the sitting Nevis Island Administration (NIA) made a pledge and commitment to the people of Nevis which it had valiantly sort to keep. 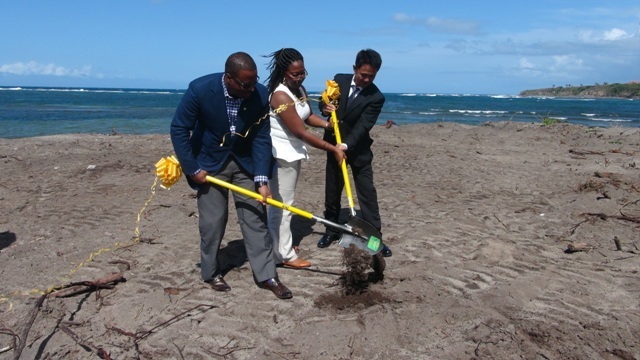 The project falls under the St. Kitts and Nevis Citizen by Investment Programme and the Deputy Premier stated that the process and necessary approvals had taken some time and he is pleased he was finally able to witness the ground breaking. He stated that the project would present a perfect opportunity to open up Nevis for more investment. The Deputy Premier used the opportunity to thank Chief Executive Officer (CEO) and General Manager of HTRIP and 1st Director of Caribbean Development Consultant Ltd. (CDCL) Mr. Jian Li for investing in Nevis and for his patience. Mr. Brantley who is also the Minister in the Federal Government pledged cooperation for the project at both levels to ensure the project’s success. Meantime, the Deputy Premier assured that investment projects would no longer take long periods to process. Mr. Brantley reiterated that there are many other investments that the island could attract particularly in non-traditional areas. “There is a tremendous amount of investment that we can attract and perhaps it is time for us to start to look to non-traditional areas for investment and we welcome this as a first wave, we hope, of investment coming to us from Asia, from China more specifically but from all of those countries who have investors who are willing to partner with us to develop our island home,” he said.